Justis Lopez stops by the Gentry Building before heading to class. It is his love for – and from – his family that drove fifth-year master’s student Justis Lopez to pursue college and to better himself. Among his biggest influences has been his mother, who worked three jobs to help support him, his younger brother and sister, along with his father, who had been injured on the job. Meanwhile, it was his high school teacher Heather (Wohlgemuth) Banas ’03 (ED), ’04 (MA) – a UConn alum – who, he says, inspired him to go into teaching. At UConn, Lopez has taken a leadership role in innumerable activities, from planning and emceeing a recent benefit concert for Windham High School to serving as the student speaker for the Neag School’s 2014 Commencement ceremony. “I’ve been part of so many amazing things and been inspired by other students doing great things,” he says. Among the many roles Justis Lopez has had on the UConn campus, he has given spoken word performances during the Neag Alumni Society Awards Dinner two years in a row. Last year, he got involved with UConn’s Hip Hop Collective, a student-run organization that seeks to empower, educate, and inspire the UConn community through exposure to hip-hop culture. The organization hosts several days of events in the spring, featuring artists, spoken word performers, a documentary screening, and more. Lopez is serving this year as the event’s education chair, where his role centers on connecting the hip-hop community and education – in part by bringing together a daylong education conference in partnership with the Neag School. “If we could recreate that [excitement] here at … Neag, our home base for education, we can inspire the future educators of the world,” Lopez says of the education conference, which is one way in which he hopes to connect Neag with its partner schools in the community. Justis Lopez gathers with his social studies cohort during the Neag Study Abroad program. 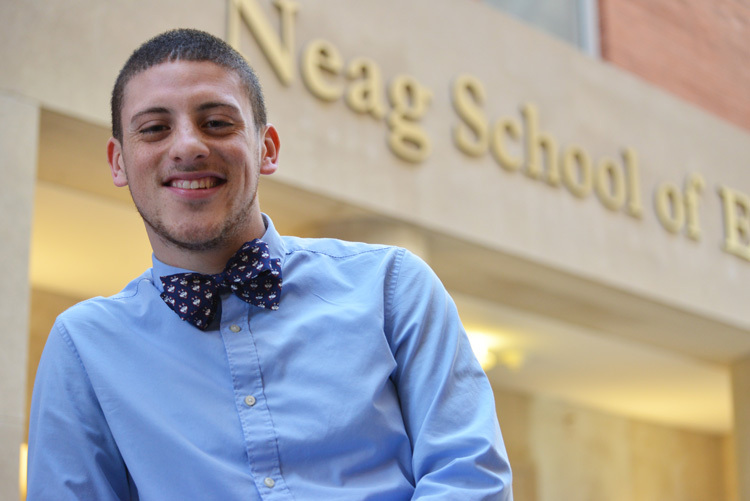 His fifth year at the Neag School has also been filled with travel opportunities. At the annual National Association of Multicultural Educators conference this past fall in Tuscon, Ariz., Lopez volunteered for and networked with faculty members, inspiring him to consider pursuing his doctorate and a possible career as a professor. The opportunity came through Justis’ connection with assistant clinical professor Mark Kohan, who calls Lopez “a catalyst for rethinking what is possible in classroom and schools. “He is a bridge-builder, not only between schools and communities, but also among students and educators from all walks of life,” Kohan says. 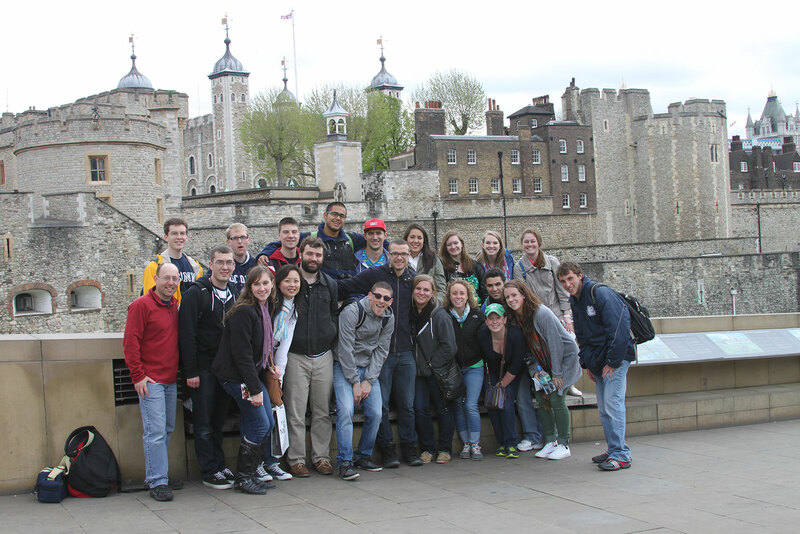 Meanwhile, his participation in Neag’s Social Studies Study Abroad Program – led by associate professor Alan Marcus – gave Lopez the chance to see Europe, where he visited museums and walked the beaches of Normandy. “It was incredibly transformative; being able to step outside my comfort zone, learn about life and history through another lens,” says Lopez. A passion for becoming a global citizen, he says, is now something he envisions instilling in his future students. Lopez has also studied closely with Marcus, including following Marcus’ work on the new social studies framework, for which Marcus served as a lead writer. The framework provides the biggest change in social studies instruction in Connecticut in more than 15 years. Banas, that same teacher who inspired Lopez back in his high school days, is his supervisor on the project. With graduate commencement around the corner, Lopez has laid a solid groundwork for his future. He will, no doubt, have lots of opportunities from which to choose. 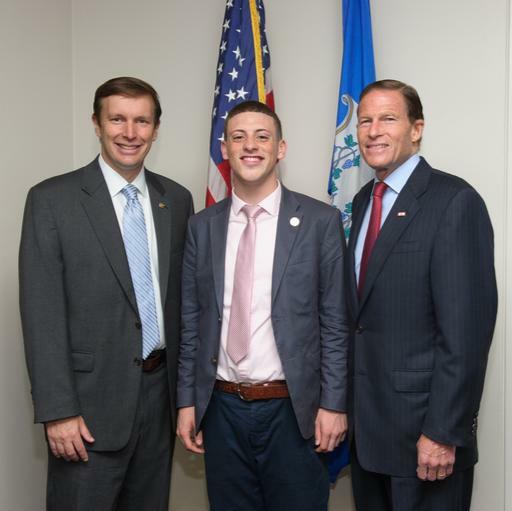 Justis Lopez meets up with the Connecticut senators, Senator Chris Murphy and Senator Richard Blumenthal, during his internship in DC. Even as he is interviewing for teacher positions with different school systems across Connecticut, New York City, and Washington, D.C., Lopez has aspirations beyond that as well – with possible sights set on eventually pursuing a position in education administration, whether it is as a school principal, superintendent, or leader in educational policy. 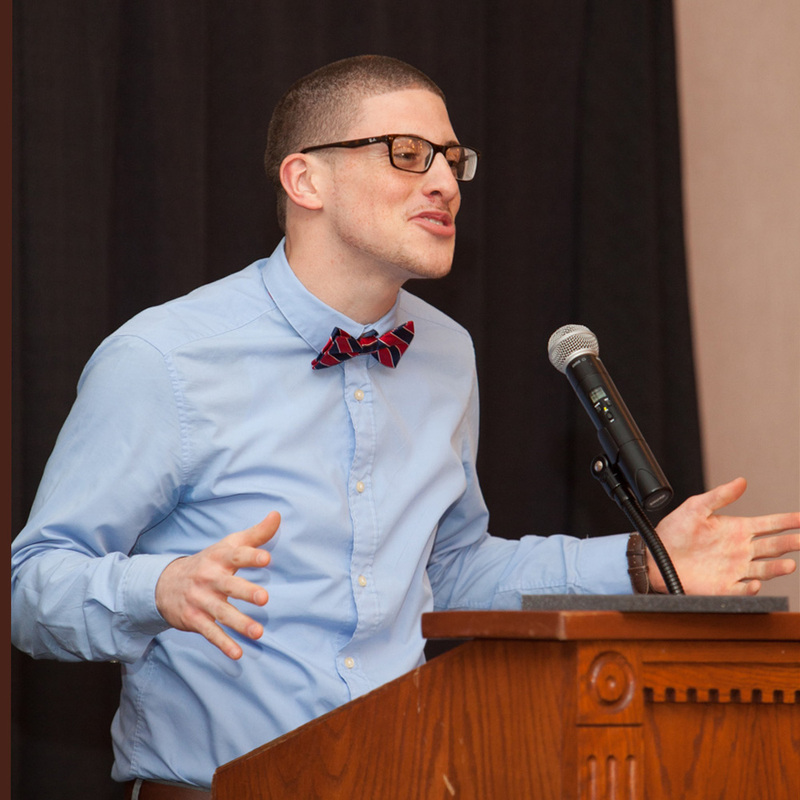 Video of Justis giving a spoken word performance during the Neag Alumni Awards Dinner.